Under the wrong lighting, makeup colors can fool you, and most vanity mirror lights don't contain the full color spectrum so it's impossible to see subtle variations in your makeup color. At 600 lux and with a color rendering index (CRI) of 90, our automatic sensor mirror has a tru-lux light system that simulates natural sunlight so you can see full color variation and always know when your makeup is color-correct and flawless. Looking good in this light means you will look flawless in any setting. Our sensor mirror disperses light evenly with a unique pattern of micro-reflectors in the outer ring, for completely even light without any light loss or hot spots. And our mirror's surgical-grade LEDs have been rated to perform like new after 40,000 hours — that's an hour a day, every day, for more than 100 years. The 5x magnification is perfect for viewing your entire face at once in exceptional detail. 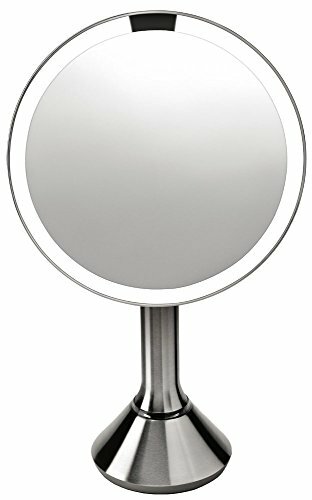 Unlike other vanity mirrors, you never have to fumble with buttons or switches because our mirror has a motion sensor that detects when you are in front of it so it lights up automatically as your face approaches. And once in use, the sensitivity of the sensor increases so it won't turn off unexpectedly. Then after it senses you are done using the mirror, it will turnoff automatically – very convenient. The sensor mirror is rechargeable so there are no messy cords to clutter up your space. And it can be used for up to 4 weeks on a single charge. The sensor mirror tilts back fully so you always have a clear, comfortable view —even while standing up. The mirror itself is made from ultra-clear, high-quality glass backed by high-purity aluminum coating that provides superior reflectivity and clarity and has precise curvature for distortion-free optics – even around the edges. If you have any questions about this product by simplehuman, contact us by completing and submitting the form below. If you are looking for a specif part number, please include it with your message.